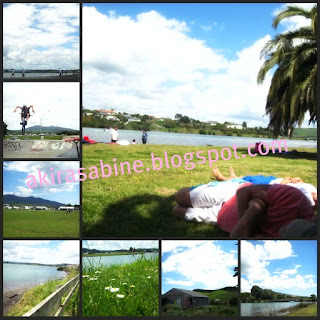 Thinking of visiting Raglan Beach for a lazy day out? Here are some pictures of the place to give you an idea of this beach located on the West Coast of North Island in NZ. 1. Skating & stunts - If you enjoy skate boarding, biking, scooter skating, you're in for luck as there's a skate park catering to both young and old. 2. Camping - There's a holiday park where you can park your motorhomes/ caravans/ cars to stay for the night. Of course, if you have a tent and prefer sleeping out, feel free to make use of it as well. 3. Water activities - Load your boat with food and a music player and then set off into the water to spend your day in the water. Else, you can also choose to do kayaking, stand paddling, surfing, fishing and swimming. 4. Snoozing - Stay close to nature by just sleeping directly on the ground like the couple in the picture. 5. Sports - There's a field for use where you can either play rugby. soccer, frisbee or any other sports. 6. People watch - Join A.S to just chill out absorbing the atmosphere. 7. Sun bathing - Join the rest grabbing the opportunity to get healthier glowing skin. Of course, if you can think of any, feel free to add to the list by dropping your comments below!!! -A.S has been back in KL, Malaysia for nearly a month now. She admits she has a lot to catch up on her blog updates. Burdened with lots of thoughts, plans and to-dos, she'll still try her very best to keep this blog alive. Thank you so much for keeping up with her delays.